BISCOTTI FOR A BABY SHOWER! Position racks in the upper and lower thirds of the oven and preheat to 350 degrees. Line 2 large baking sheets with parchment paper. Place walnuts in a single layer on a baking sheet and toast in the 350-degree oven for 10 minutes. Transfer to a cutting board and coarsely chop. Set aside. In a large bowl, hand mix toasted walnuts, sugars, cinnamon, baking powder and flour. In a small bowl, whisk eggs. 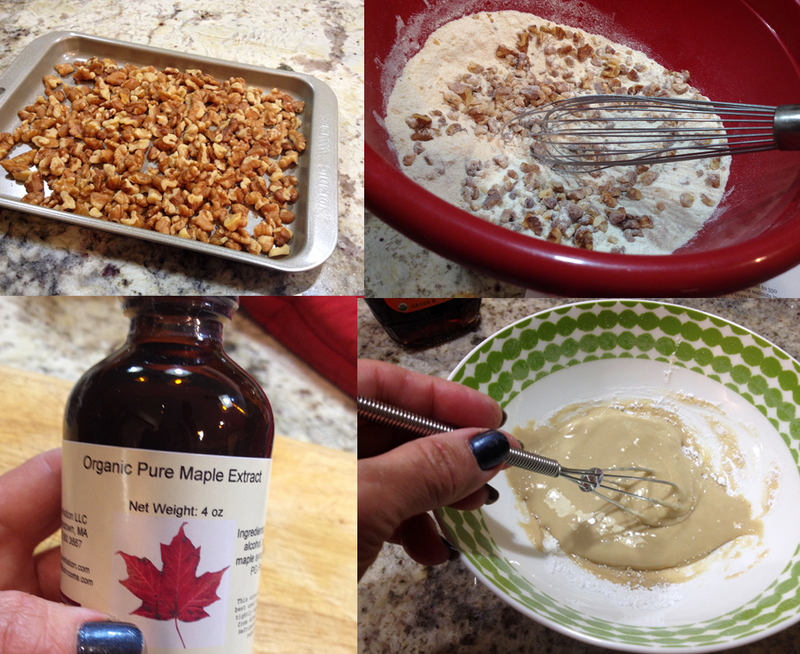 Add maple extract and whisk until well blended. Add to the flour mixture. Stir a few times. Work the batter together with lightly floured hands. Keep squeezing the batter with your hands, until a dough starts to form. Shape as a ball and divide it into 4 equal pieces. On a lightly floured surface, place one piece of dough, and using your hands, roll into a log shape that is approximately 8 inches long, 2 inches wide, and 3/4 of an inch high. If it’s sticky, simply dust your palms with more flour. Repeat with remaining three pieces of dough. Brush loaves all over with 1 lightly beaten egg. Bake for 40 minutes, rotating pans halfway through, or until the tops of the loaves are shiny and deep golden. Cool on a rack for about 20 minutes before slicing, using a large serrated knife. Cut 3/4-inch-thick slices, using a sawing motion to prevent crumbling. Each loaf should yield 9 to 11 cookies. Place slices on their sides back on to the baking sheets; place in the still warm oven with the temperature off and the door closed for 30 to 60 minutes. The longer they stay in the oven, the harder they will become. Remove from oven and cool completely before storing in an airtight container. To make the maple icing, mix the confectioners’ sugar and maple syrup in a small bowl and whisk briskly until the icing is smooth and opaque and clings to the back of a spoon. 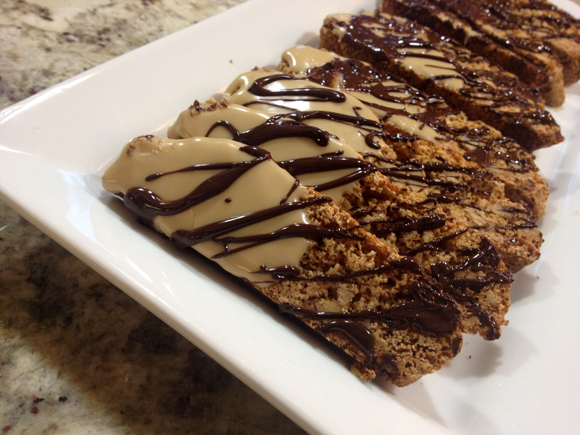 Dip a teaspoon into the icing and drizzle the spoon back-and-forth over the biscotti. Allow to dry completely before storing. Store biscotti in an airtight container, preferably a tin, which helps keep them crisp. Comments: I was a bit nervous about this baking adventure, because I know that biscotti can be tricky to make, and that very few things are worse than bad biscotti, right? I fell in love with the flavors of this recipe because anything with maple makes me all warm inside, and walnuts only make it better. I suppose most people go crazy for chocolate, but I usually opt for other flavors in sweets. The recipe called for maple extract, because it has a more concentrated flavor, so I was “forced” to place an order for some. It smells amazing! One of the tricky things about biscotti is slicing them after the first bake. You are supposed to wait for 20 minutes, and use a good quality serrated knife for the job. Worked great, I had no problems. By the way, I made half the recipe, and ended up with 18 biscotti, some quite small, cut from the edges. They are also called “sacrificial biscotti”. Honest. Not making that up. I went for a double type of icing, the maple called for in the recipe, and then a drizzle of chocolate for cosmetic purposes. But, after tasting them, I do think the chocolate drizzle did more than beautify them. The taste complements the maple and walnuts quite well. 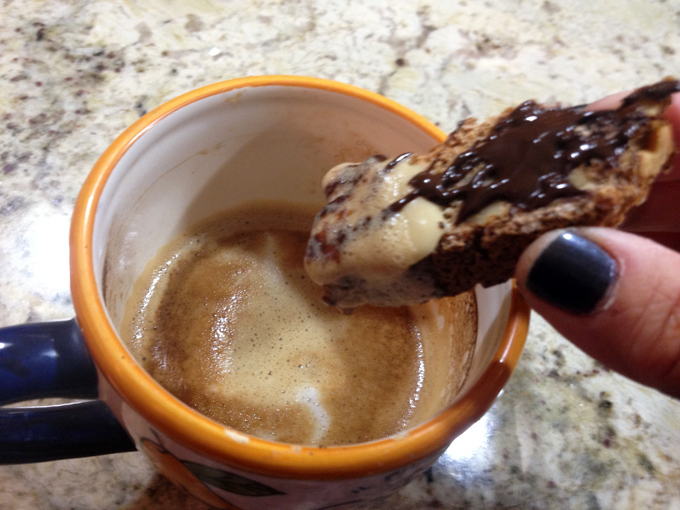 Now that I am older, not necessarily wiser, I dunk my biscotti into a steaming hot cup of cappuccino… Great way to start any day!